We sure did pack in the painting with Kathie during our 3 days this year, each day different new techniques and skills. I’ve painted with Kathie, learning batik, but each time I paint with her I learn something new, and this year was no exception. And Kathie is such a patient, sharing person, giving her time and talents to everyone of us at her class. Once more a successful seminar. 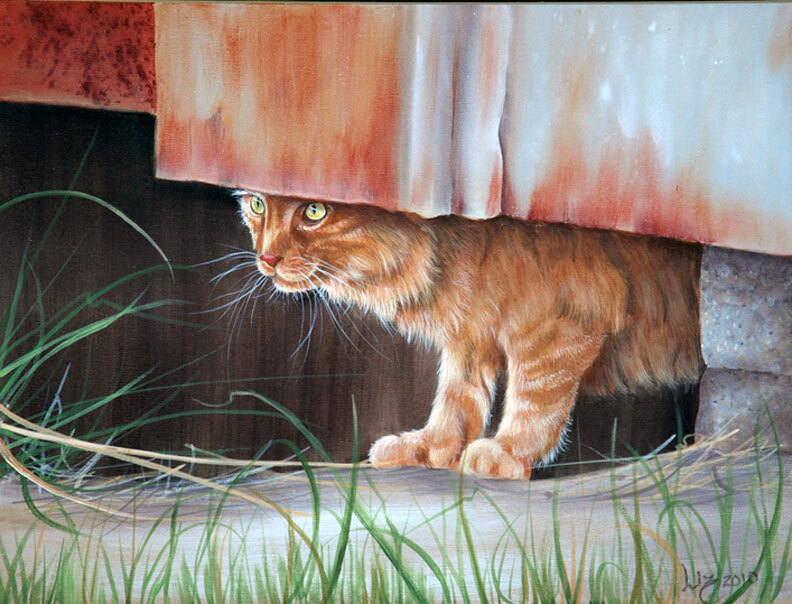 And Kathie is taking some lucky painters on a painting holiday to South Africa next April 12 -23, 2014. Be sure to check out the details on Kathie’s web site. You might just want to join her. Here a just a few moments from our seminar. I was so absorbed with my painting that I didn’t get photos the first 2 days so here is our last day of fun. Love the ducks and the dyes. We’re making plans for more dye projects. What fun. 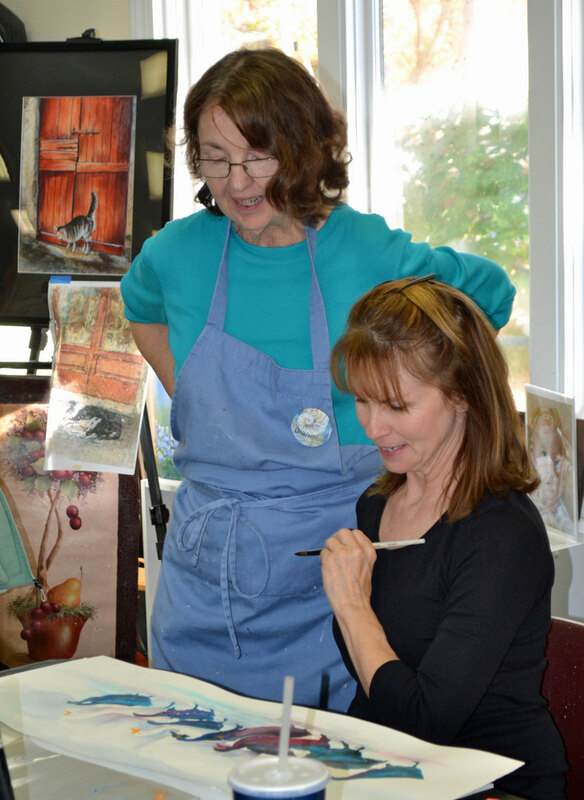 Notice the concentration and then smiles with the completed paintings. I just took some time to read and learn. Forget the “to do” list and enjoyed learning from some other artists. What inspiration! Now my mind is into “what if I tried this or I want to try that technique”. My day just became a lot more fun. Thanks Kathie George/Watermedia Workshops and Nancy Medina Art Studio my inspiration for today. If you don’t follow Kathie you really should. Keep scrolling down on her blog to find her wonderful lessons and tips. Nancy Medina is a wonderful inspiration also for forgetting that word “perfect” that really doesn’t exist in art anyway. · Kathie George seminar is coming up quickly. We still have some seats if you would like to join us. I have the prep and patterns at the studio if you have already registered. 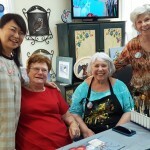 We have some exciting new techniques and lots of fun planned with Kathie. Mixed Media with powdered dyes. Watercolor with cheese cloth accents. 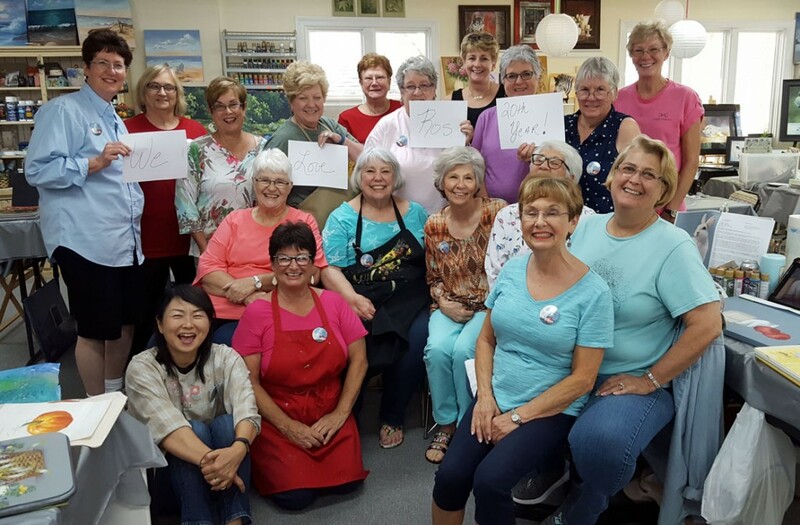 We’ve had a fun and busy summer at Artful Endeavors filled with seminars, workshops, and classes all exploring new subjects and techniques. I’ve added just a few photos here for our reminiscences. Notice all the smiles. Please check our seminar pages for more of out photos for Ros’ seminar and ArtFling. Our parent/grandparent and child class. I just got back in town this afternoon from teaching a terrific group of women in the DC chapter. We had good time painting and they treated me royally. We painted the leaf trilogy, chickadee and dogwood, and Under the Maple, so lots of techniques and lot of painting to do, but, they were up to the challenge. It’s now fall with a little nip in the air, at least today. 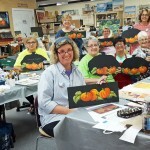 Our upcoming painting schedule is filled with fall and holiday projects. · Enjoy the fall weather! That should get me through the next week and a half. · Our last cat and pumpkin key ornament class is this coming Wed at 5:30-8:30p. Our young painters could do this class also. · Wed 10am we start the Candy Canes. There’s still time to join us. · No Tue evening class this week. Next week is our first night at DU Salon in Cary. Our terrific new Creative Workshops site is up and running. To celebrate we’re having a blog party all this week where you visit the teacher’s blogs and can leave a comment for a chance to win free classes as well as see their wonderful work. Check out my blog to get started and for links to the other teachers. Remember to leave a comment. What fun! Register now for our seminar with Kathie George, Nov 11, 12, & 13! I hope to see you at the studio soon. · We’re painting with Ros next week so there are no regular classes. The following week I am taking off for a short break to catch my breath. Classes will resume on Aug 6 & 7. Tue open class resumes on Aug 6. Let me know if you plan to join us. 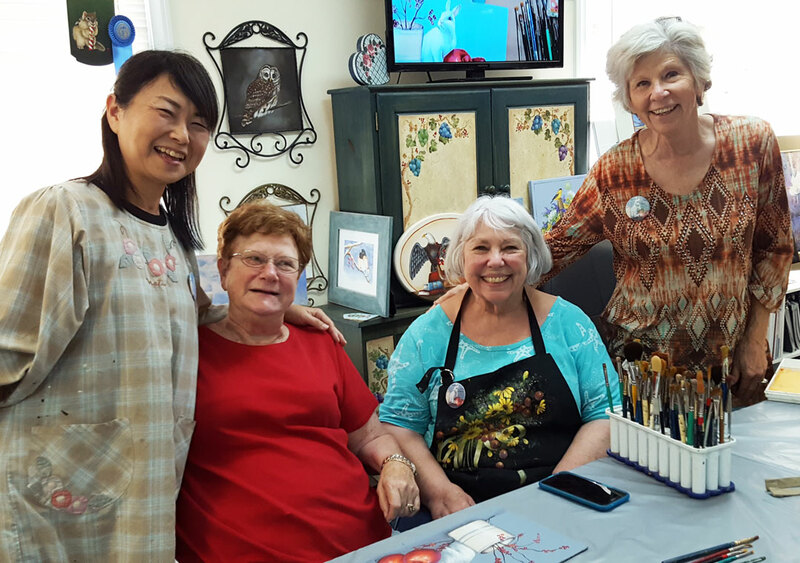 · We have lots of fun painting planned for Aug so be sure to plan ahead. You can register for all the classes on line or at the studio. Wed am starts the Wolf on Aug 7 so be sure to get your prep this week. He’s a handsome fellow I think. Register now. 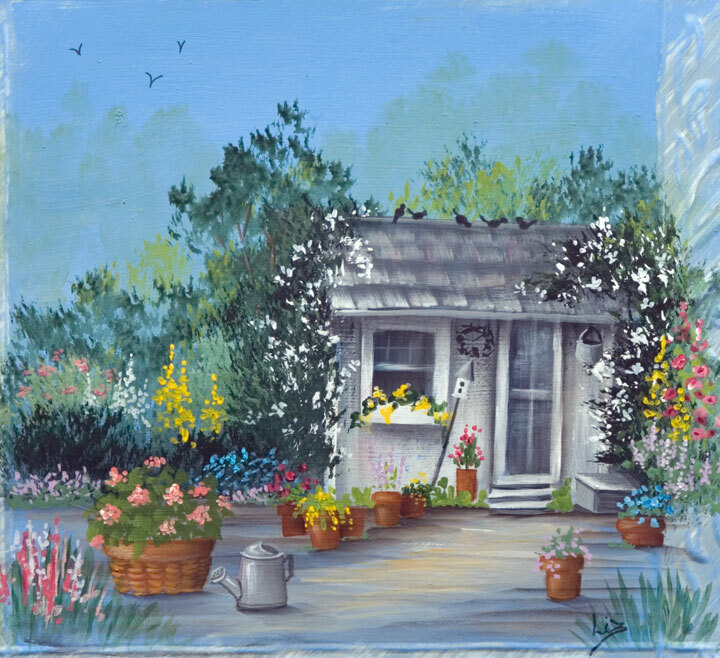 · Wed pm continues with Basics on Aug 7 with Trudy Beard’s Garden Shed. We’ll be using lots of good refresher techniques and finishing a delightful painting in our 3 hrs. Anyone can join us for some painting fun. Register this week. 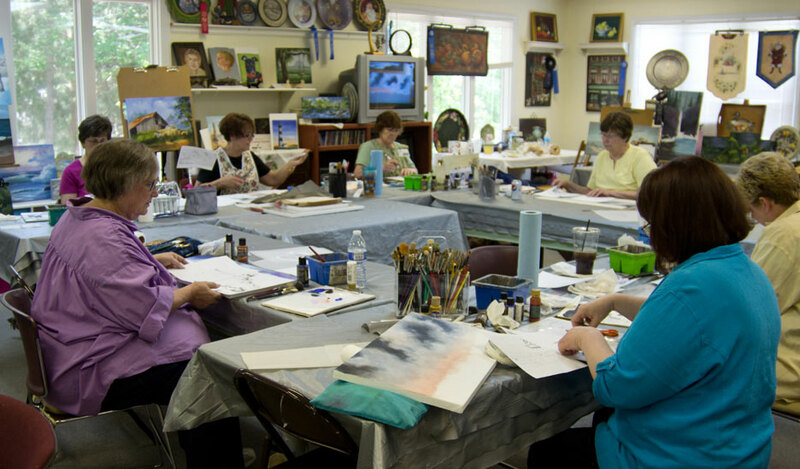 · Wed afternoon, 2p-4p, painters are working on the Iris in our open class. If you want to paint this beautiful design join us either this week, tomorrow, or Aug 7 . Get your prep this week. starting Aug 13, contact me to register and get directions. 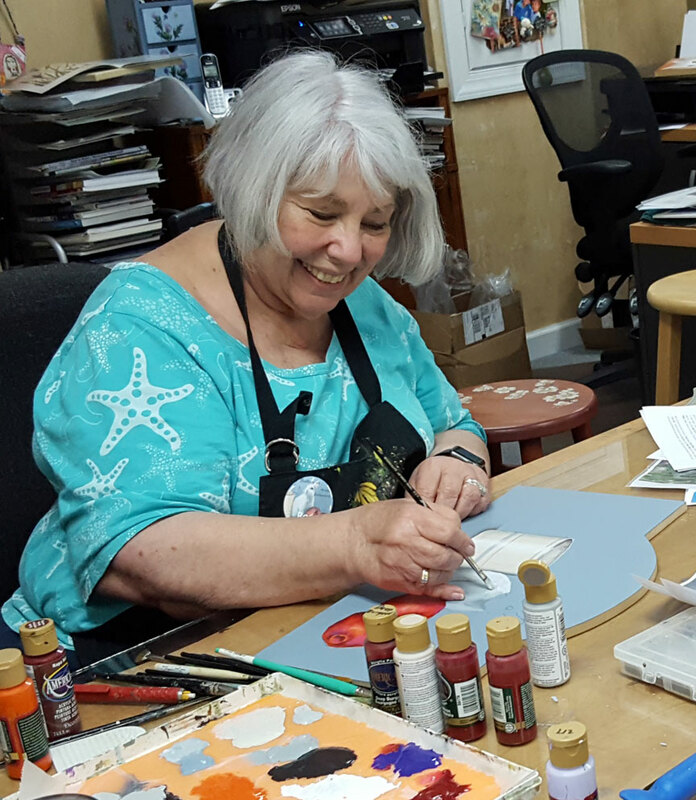 · ArtFling update: If you can’t resist joining us for Gail’s Gelli Print class, and I hope you can’t resist, please register by July 30. Gail needs to order our Gelli mats so that we’ll be prepared. Plan on joining my nostalgic, misty morning, Rope Swing class too. I won’t teach this project again for at least 6 mo. So don’t pass up this opportunity. Don’t’ forget to register by July 30. Did I mention that you should register by July 30? · It’s also time to register for the Cobalt and Hydrangeas if you haven’t do so already. This will be the last time I’ll teach this project for about a year. Register by Aug 23. · We’ve schedule another parent/child class for Aug 6, that’s Tue afternoon, 1p-3p. We’re painting a light house! Plan to join us. Register by contacting me by the end of July. Hope to see you at our air-conditioned studio in Aug! June 2013 started with a hot day outside and some cool painting inside the studio. 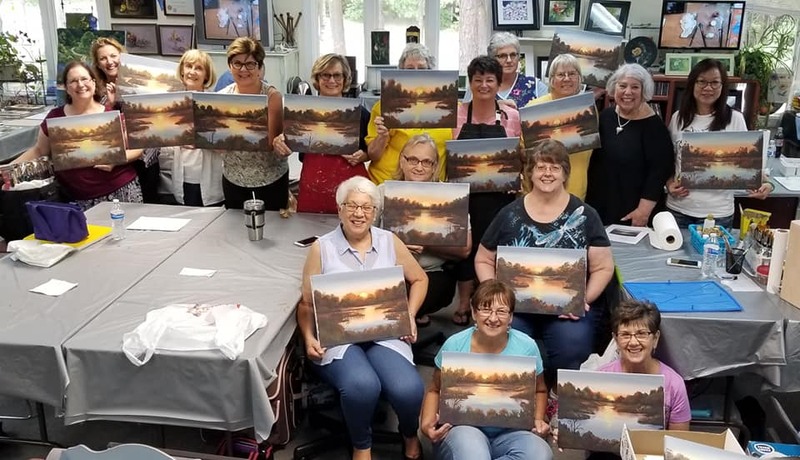 We had a lively group of painters here on Sunday painting stormy skies of Night Vision: learning, laughing, and scheduling more workshops for the summer. Students left the studio commenting on how much they learned from this class. On Aug 31 the students have schedule for me to teach my Cobalt and Hydrangeas design. This will be the last time I can teach this design for the year so be sure to join us in Aug.
I’ve been busy painting upcoming projects for workshops. I finished my Rope Swing design for our Summer’s End ArtFling. I’ve been wantign to paint mist and have had a request for a weeping willow. Here I’ve combined them both for what I think is a nostalgic painting bringing back memories of early morning from younger days. I’ve designed this painting for all levels, so no prior painting experience is required, but always appreciated. 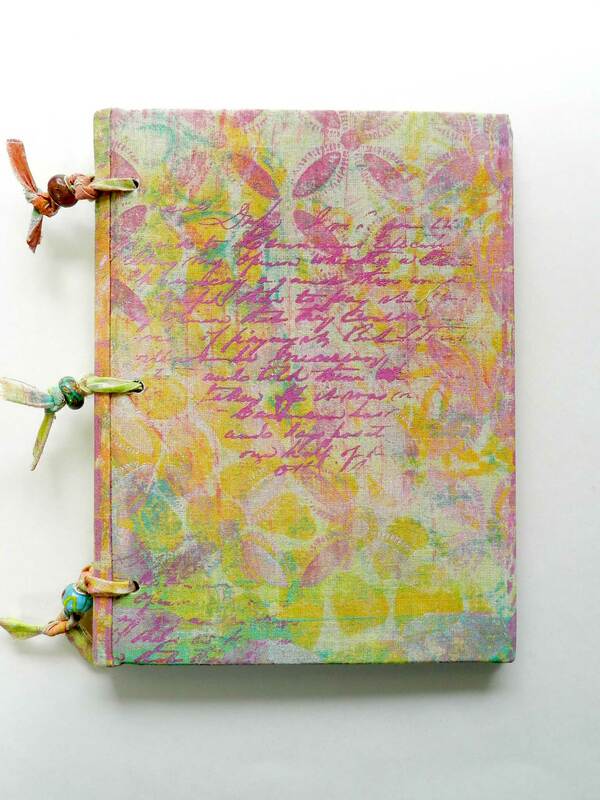 Gail has become a Gelli printing addict and she is planning to share her Gelli passion with us. Each participant will get their own Gelli plate to experiment with and keep. You’ll mono-print on fabric as well as paper. Find more information and register here! The Bodie Lighthouse was another of my recent paintings. This is one of the 3 hr workshops coming up June 21, either day or evening, your choice. No experience needed to join us for one of these workshops. Supplies and surface is included. Register now! Starting this Wed evening we will paint the Susan Crouch Watercolor Sheep. This will be a 2 week class June 5 & 12, starting at 5:30p until 9p so that we’ll finish in the 2 weeks. We’ll have fun exploring new watercolor techniques for novice watercolor enthusiasts. Register now. but I am keeping a wait list and if we get enough interest on the wait list we can see about adding another class. More information and registration! painting a batik, Cat in the Snow, who is actually my cat from a photo that I took in the 70s. How “cool” is that. Then there is the Ducks in a Row, my personal favorite, using powdered inks for a very interesting effect. Leave it to Kathie to keep coming up with exciting new techniques for us. Register now! Gail and I are ready for our Summer’s End ArtFling, Aug 17 & 18. We’re asking everyone to register by July 31 so that we can make sure to have all the supplies ready for class. Plan to join us for some Gelli-licious, paintabulously, creative fun. Register now! My next trip to Litchford Falls Healthcare and Rehab Center to demonstrate for the residents is coming up June 13, 2p, if anyone would like to accompany me. I have a following of residents that join me each month to make suggestions and approve my painting. This is a very rewarding trip for me, sharing my love of painting, and giving back to our community. And enjoying some special people I’ve met there. My vacation is coming up the last week of June. It’s time to study the ocean waves, sand dunes, and coastal skies, just for reference of course. So no classes June 23 – 30! Be sure to check the schedule for updates and additions. We’re being creative with our class times this summer so double check hours too. So much to paint and so little time. 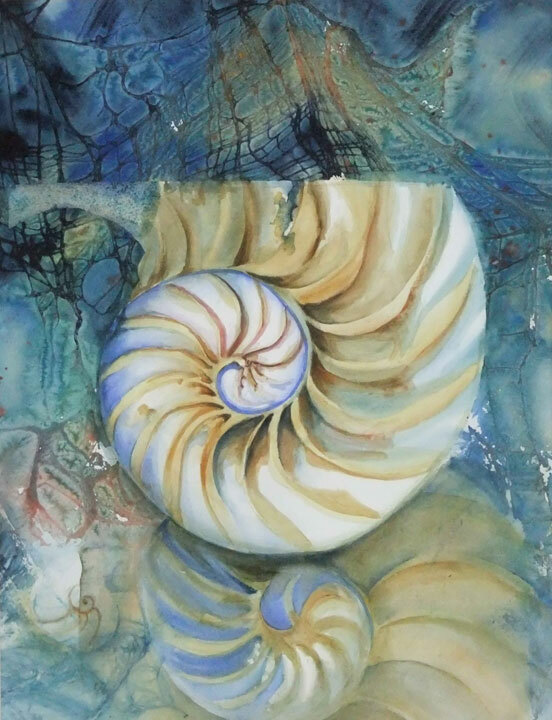 Gail Schmidt (my very good friend) from Shabby Cottage Studio and Creative Workshops online classes and I are teaming up again this summer to bring you an exciting Aug weekend workshop/retreat at Artful Endeavors. Gail will teach some splendid Gelli design techniques. Each participant with get their own Gelli mat. I’ve seen her working sample and I want to do that! Just so you know, Gail is artistically fearless and has an awesome design sense that she willingly shares. We always learn so much and have such fun with Gail. She is very creatively inspiring. I will bring some fabulous different painting techniques including an original new design never before offered. Come join me for a day of immediate gratification with some of the most art fun you’ll ever experience without using a brush or a palette. We work with the Gelli Arts Gel Printing Plate that allows for some fabulous monoprinting results without a press. The results are always spontaneous, always a surprise. Absolutely no experience is needed and you will be amazed at the gorgeous prints you create. The Gel Printing Plate and brayer needed for this technique is included in the price of the class and is yours to keep when the class is done. stress relieving. Sometimes art just needs to be about play and Gelli printing is all about play! $145 includes Gel Plate, brayer, and most supplies. In our acrylic class we’ll create the effect of a misty background with a tree swing waiting to invite you to join the unfolding story. We’ll learn to create atmosphere and texture on canvas with our acrylic products as we develop the feeling of anticipation in our painting. $85 includes 12 x 12” canvas, paints, and products.